As someone who has, on various occasions, been forcibly removed from not one, but several venues across London for ‘excessive musical performance’, its safe to say I’m a far cry from introvert. And I, like most, relay this information via my personal style: thigh-high boots, neon fur coats and dramatic sunglasses are just a few of the peacocky items in my wardrobe that I feel most at-home in. That being said, I simply cannot rid myself of an irrational fear of the most extroverted garment of them all – the print. Be it polkadot or paisley, ikat or florals, I just can’t bring myself to wear any of them – even the Breton Stripe brings me out in hives, and I’m really not sure why. Perhaps it is that my mother used to dress my younger sister and I in matching print outfits up until the age of 10. As an older sibling desperate for a sense of individuality, do I have some kind of fashion PTSD? Or maybe its that I just find prints unsustainable and fleeting. Aside from leopard print in the winter and florals in springtime, other prints seem to occupy such a short tenure in the world of fashion, before they’re kicked to the kerb next to adult jelly shoes and Bieber merch. One minute gingham is all the rage, and the next month its only fit for table cloths (I know this because I dared to wear a gingham skirt a few weeks ago, and more than three people asked if I had come dressed as a picnic). But the most likely answer for my avoidance of prints, I suspect, is that I never like to look too ‘done’. I’m not a girly dresser, and I feel prints are often too feminine or too busy to work into my usual wardrobe. I wear a lot of blacks, whites and neutrals, and I like to stick to statement pieces or clean-cut basics that won’t go out of style in a hurry. Prints just seem too tricky for me – but as someone who wears almost every other daring trend with ease, that sounds a bit silly, doesn’t it? I’m lucky to have been afforded the opportunity to write about new trends for Into the Fold, and it has challenged me to try styles that I never normally would, but when it came to tackling prints, I knew I had to ease myself in with something that still felt ‘me’. So when VOGUE named zebra print as one of the hottest trends of 2018, I thought I’d give it a whack. 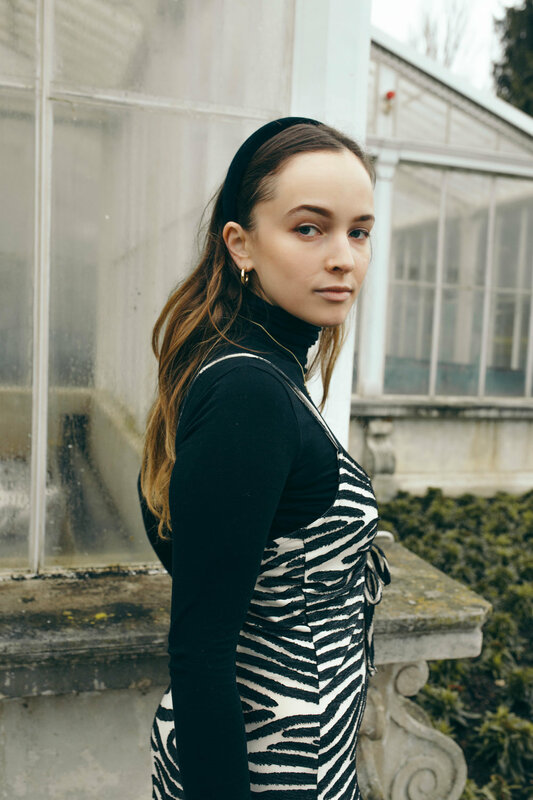 Here, I’ve paired a zebra midi dress (£19.99) from Zara with my signature black turtleneck and sneakers: simple, cool, and I actually very much like how I feel in it. Perhaps zebra is a print I can get down with, and its monochromatic colour means that it’ll go with just about anything. In the summer, I’ll wear this dress with a white t-shirt underneath, or over bare skin on hotter days, and I may even pair it with a neon oversized blazer and gold mules, if I’m feeling particularly brave. I felt my second look needed to involve a bit of colour, otherwise it would‘ve been cheating (black and white prints are too easy), so I went for this Balenciaga-esque floral number – also from Zara (£12.99). I don’t think I’ve everworn florals, but I’ve got a bit of a penchant for anything reminiscent of the 60s and 70s, which this top definitely is, so I thought, ‘Why the hell not?’ I’ve paired it with vintage jeans and red sock boots here, but it also looks surprisingly elegant with my cream tailored kick-flares and a tan trench coat. Again, I’m pleasantly surprised at how versatile a print can be, and even more so how confident I feel in a bold pattern – maybe prints aren’t that scary after all?